I was in Japan for about a week this June and while I enjoyed many different parts of the trip, one of my focuses was definitely to check out the Gundam and gunpla-related places in Japan. Hopefully, this post will help those who are planning on visiting Japan at some point understand a little better how one can experience Gundam culture as well as good places to buy gunpla in this country. My first stop in Japan was a brief one-day stay in Osaka. Fortunately for me, I had an hour or so of spare time before dinner that day to wander around Den-Den Town, a shopping district in Osaka known for its stores that specialize in otaku interests. Surprisingly, it was here (not Tokyo) that I actually found my best deals on gunpla in Japan! The first store I wandered into, the Joshin Super Kids Land Character Pavillion, ended up being the only place I needed to go to for my gunpla needs. First off, I knew that I wanted a pair of God Hand SPN-120 nippers since it’s hard to find in the U.S. and often more expensive here. I found it in this store (there were only 3-4 left and the employee actually had to get them out of a locked cabinet behind the checkout counter) for 4800 yen, a price I was pretty happy with. I also picked up the RG Tallgeese, a gunpla I nearly pre-ordered in the states for $30+ for only 2000 yen. When I went to the checkout counter, I was in for a surprise. First, I didn’t have to pay taxes as long as I showed my foreign passport, which saved me the 8% sales tax. Also, when I paid with a Visa credit card, I got an additional 5% off the total price. So in the end, my final tax-free price was 6460 yen, or slightly less than $59 for the God Hand nippers and an RG Tallgeese. This is a savings of over 30% from Amazon prices in the U.S! 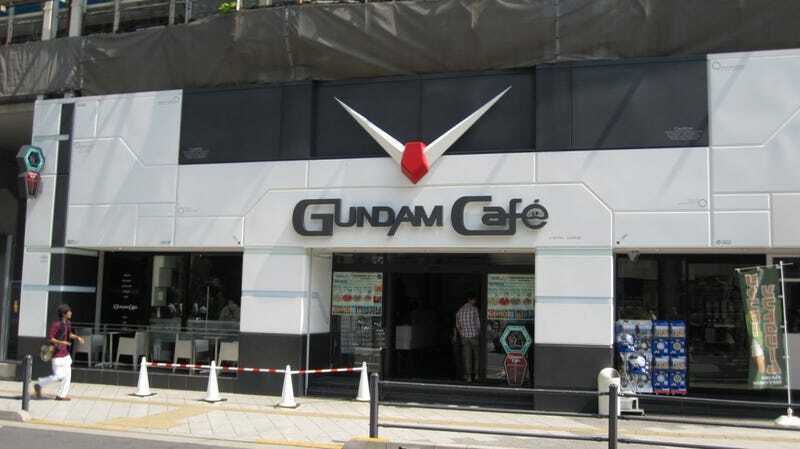 My next Gundam-related stop on the trip was the Gundam Cafein Akihabara, Tokyo. I went on a Thursday evening and unlike the Square Enix cafe I had tried to get into, the Gundam Cafe was nearly empty as it was closing soon. For food and drink, we got a curry and a noodle combo alongside a blue vodka drink and a cute Haro dessert drink. Overall, the food was ok, but not great. However, it was reasonably priced at $9-10 per entree and the drinks were cheap too. Everything, of course, was Gundam themed and I really enjoyed the atmosphere in the cafe, especially the TV in the background that was playing opening themes of every Gundam series. Getting to DiverCity Tokyo Plaza to see the life-sized Unicorn Gundam as well as the Gundam Base (below) is definitely not ideal, since the area is kind of on an island that’s not close to many of Tokyo’s other attractions. In addition, the Tokyo subway lines do not reach this area and we had to pay extra to take the Yurikamome Line for the round trip, since our Tokyo metro day-passes could not get us there. However, the Unicorn Gundam and the plaza is definitely worth the trip if you’re a Gundam fan. It’s as large as you would expect a real-life Gundam to be at nearly 65 feet tall, and the level of detail was also impressive. Each individual panel and joint looked carefully made and some even had realistic instructions printed on them (for example, one said something like “make sure to restore this part after a battle”). Unfortunately, I only got to see the model in Unicorn Mode during the day, but apparently it undergoes multiple transformations everyday between Unicorn Mode and Destroy Mode. It’s also apparently spectacular to see after dark. The Gundam Base is located in a large corner of the top floor of DiverCity Tokyo’s main mall and it was definitely one of my favorite parts of my Japan trip. The first thing I noticed, however, was the despite its massive collection of gunpla, the Gundam Base’s merchandise was vastly overpriced compared to some of the mainstream stores in Akihabara and definitely compared to Osaka’s Den-Den Town. That said, there were many fantastic displays in the area, as well as hundreds of gunplas, including those in the builder room pictured above. Just when I was about to leave without buying anything, I stumbled upon the area I had been looking for (did I mention how large the Gundam Base is?). There’s an entire section of Gundam Base exclusive gunpla in the store and it was there that I bought a RG Wing Zero Clear Color (Gundam Base exclusive)model kit. Seeing it for $50-70 online in the U.S., I was shocked to find it priced at less than $30 here. I guess that’s why it’s a Gundam Base exclusive. Even though I wasn’t planning on buying other gunpla, I couldn’t resist the excellent value. If you’re visiting cities other than Tokyo (like Osaka), check out their otaku shopping areas for gunpla merchandise. It’s probably cheaper than what you’ll find in Tokyo and especially at the Gundam Base. That said, check out the exclusive section at the Gundam Base if you’re looking to buy something harder to find in other countries. When making any hobby purchases in Japan, remember that you can probably get it tax-free if it’s over 5000 yen and look for signs for Visa discounts as well. Save lots of room (or bring an extra suitcase like I did) for your gunpla and hobby purchases. Those boxes do take up a lot of space and you don’t want to damage them in your luggage. In the end, if you’re a Gundam fan planning a trip to Japan, I would definitely recommend visiting all of these spots. Hopefully this was useful to some of you and I’m looking forward to hearing your experiences in the future!